Law enforcement officers stand together after the fatal shooting. THE PRIME SUSPECT in the “cold-blooded assassination” of a Texas sheriff’s deputy has been charged with murder a day after the officer was gunned down from behind and shot multiple times at close range. The fatal shooting prompted an emotional reaction from local officials, who pointed their finger at ramped-up rhetoric against police officers in the US in protests against perceived police brutality. 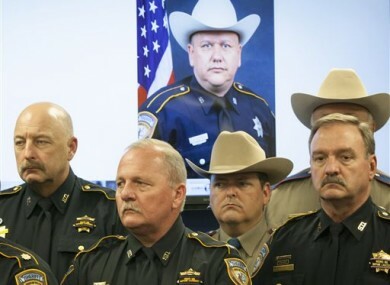 Darren Goforth, 47, was killed Friday night in the Houston area because of his job, Sheriff Ron Hickman said, announcing the charges against the alleged gunman. Shannon Miles, a 30-year-old black male with a long criminal history, had been charged with capital murder, said Hickman. “He does have previous criminal history that includes charges for resisting arrest, trespass, evading detention and disorderly conduct with a firearm,” Hickman added. Hickman earlier said the killing was one of the worst he had seen in 45 years in the job. Goforth, a white, 10-year veteran of the force, was married with two children. Earlier, Hickman said the shooting was part of a dangerous rhetoric in America and local officials connected the killing to a series of protests in major American cities against the police. “At any point when the rhetoric ramps up to the point where calculated, cold-blooded assassination of police officers happen, this rhetoric has gotten out of control,” Hickman said. “Black Lives Matter” became the recent rallying cry for protesters demonstrating against a string of killings of unarmed black men by police officers. Starting with the gunning down of 18-year-old Michael Brown in Missouri one year ago, demonstrations around the United States have condemned law enforcement’s use of deadly force and called for reform of the nation’s police departments. The protests that kicked off in Ferguson renewed a debate on race and policing in America and led to reform efforts leading all the way to the White House. But the focus on condemning cops also caused police forces to say they were being unfairly targeted, increasing their risk in an already dangerous field. Two police officers were gunned down from behind in New York last year by a man who was seemingly angered by recent police killings. New York police lashed out at government officials they thought were being overly sympathetic to a protest movement that had dangerous implications. Statements from Texas on Saturday lined up with that feeling of neglect and anger. “It is time for the silent majority in this country to support law enforcement,” said district attorney Devon Anderson. “There are a few bad apples in every profession, that does not mean that there should be open warfare declared on law enforcement,” she said. Email “"We've heard black lives matter. All lives matter. Well, cops' lives matter, too." ”. Feedback on “"We've heard black lives matter. All lives matter. Well, cops' lives matter, too." ”.